I didn't plan on riding to the top of Mount Diablo, and I certainly didn't plan on doing my first such ride on one of the coldest days of the year. But last night I noticed that Different Spokes San Francisco was running a ride today, and I decided to head up to Walnut Creek to see what would happen. From our starting point at the BART station, the 3,849-foot summit looked quite challenging, and the mountain certainly did not disappoint. Honestly, though, the climb was not as challenging as I had feared. There was an easy bailout available just past the halfway point, but I felt confident (and/or foolish) enough to continue on to the top. My reasoning was that I'd never gotten so close to the summit before, so I had to at least try. There were certainly difficult segments, especially when the road briefly cranked up to grades of well above 10%. But most of the way, the incline was a more reasonable 5% to 7%, a level at which I can comfortably spin in my lowest gear without having to pump and exert on each stroke. Diablo veterans know, however, that the final 0.1 mile before the summit is a nasty, nasty climb of more than 15%, and by then I was sufficiently worn out that I needed to take a break halfway up. But then came the descent. I, of course, never descend too fast anyway, and I had to descend about 12 miles in freezing temperatures. How cold? The temperature sensor on the reporting station at the summit is apparently broken, but at 2,040 feet, today's highest temperature was apparently 40 degrees. Add in the wind from descending, and that's cold. I had "winter" gloves and a face mask, and I was wearing long fleece pants over my long-legged cycling pants. I had a thick jersey, a vest, boots over my shoes, and a jacket. It was not enough. I made it down the first 4.5 miles to the ranger station, but by that point my fingers were frozen and numb and quite possibly on the verge of injury. I needed quite some time -- most of which was spent sitting on my hands and sticking them inside the fleece -- to get myself ready to continue. I decided to retrace my route on North Gate Road rather than go down South Gate Road as the route sheet said, mostly because I didn't want to have to deal with an unfamiliar road in the challenging conditions. Even then, I had to stop again partway down for another warming break. Fortunately, the temperature increased slightly with the lower altitude ... but today's official high in Concord was only 46 degrees. Once out of the park, it was a mostly uneventful -- and slightly downhill -- final few miles back to the BART station and my car's heater. The other four riders (who had decided not to attempt the summit after a minor medical issue came up) had already left, so I didn't feel too bad about "cheating" and skipping the South Gate Road part of the ride. With this ride, I finish the year at 7,091 miles of cycling, which is my most ever ... and a level that I'm not likely to match in 2011 or any other year. The time spent reaching this milestone was substantial, and I often cycled at the expense of other activities that could have improved my overall fitness -- and made climbs like today's less painful. But I can now say, like countless "real" cyclists, that I've made it to the top of Mount Diablo. I'm just not feeling the need to do it again any time soon. I'm scheduled to ride the Death Valley Century in February. Having only done this route once, many years ago, I decided to test-ride the most rolling part of the route: the 35-mile round trip to Badwater, at elevation -282 feet -- the lowest place in the Western Hemisphere. To my surprise, the route appeared to be just as challenging as when I did it back in 2004. 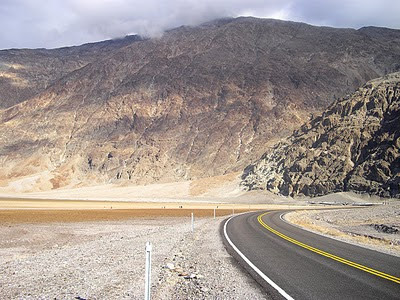 Although the elevation stays in a tight range of between sea level and -282 feet through the entire distance, there are several hills of moderate grade and distance -- the floor of Death Valley is far from flat. I still found myself struggling up (and cautiously descending) the steeper hills. And the lack of landmarks and intermediate waypoints made the miles seem to go by very slowly. After about 10 miles or so, the amazing scenery was starting to look all pretty much the same ... even though this day was unusual because of the heavy rains that recently had passed through the area, leaving several muddy spots on the road and many wet areas that normally are dry. Such admiration for nature was not at the forefront of my mind as I turned around just past Badwater and realized I had another 17 miles of the same old thing before I'd be back in Furnace Creek. My return trip was brightened considerably when, out of nowhere, Adam mysteriously appeared behind me in a rental car. After agreeing to meet back at Furnace Creek, I felt determined to get there as quickly as possible, and the stats show it -- my average for the day was 14.4 mph, but that was more like 13 mph out and 16 mph back. And that's important, because even with my complaining about the terrain, that's significantly faster than when I did the route six years ago. The ride helped build confidence that I can complete the century in February ... but I think I'll also be quite content to turn around prematurely and, perhaps, call it a metric if the day isn't just right for me. I got the sightseeing out of my system on this trip, so in February, it'll be just another big ride with hundreds of other cyclists ... but with just one stop sign in 100 miles, and not much else to mark the way. Making the call whether to ride this morning was admittedly difficult. And given how shockingly inaccurate the weather forecasts have been this season, perhaps I should have known that things wouldn't turn out as expected. But when I woke up this morning and checked the radar, it looked like we might have a few hours of no rain, and that might be enough to get in most or all of our scheduled ride. The four brave riders who hit the streets of Mountain View this morning got treated to a surprisingly moderate to heavy rainfall almost immediately after we started riding. But we didn't let that stop us! We soldiered on, and the rain started to let up. By the time we had completed 12 miles and returned to our starting point, the rain had stopped, and we were just left with a damp wind that had been slowly building throughout the morning. We all decided that discretion was the better part of valor, and we declared the ride complete and successful after just one of the three scheduled segments. Indeed, the ride was successful. It reinforced the notion, even for me, that I can ride in the rain when I have to, and it's not the end of the world. It's good to have a reminder of this every once in a while because rain can happen during training rides ... and even on the event itself, as we found out on the infamous Day 6 of ALC8 in 2009 when the day's ride was canceled after hundreds of cyclists had made their rainy way 15 miles up the hill out of Lompoc. Today's weather wasn't as bad as on ALC8, but it was a good example of what can strike almost any time during training season. We did all the right things about riding cautiously, avoiding holes and puddles, watching out for each other, and not riding on the oh-so-slippery pavement markings. And if you haven't done so already, be sure to give your bike a thorough cleaning (not at the high-pressure car wash, please!) and lubrication. Then have a good rest, because you earned it today. This was my last official training ride of 2010, but I'll be back in January. I might offer the Dumbarton Bridge ride (originally scheduled for today) sometime in early January; watch the calendar for details. All the best during this season, and thank you for being part of AIDS/LifeCycle. Update: There was a magnitude 3.1 quake centered in Los Altos while we were riding. We had no idea. Wow, talk about an off-base weather forecast. The predicted sunny skies and 70 degrees actually ended up being chilly, drizzly fog and about 55 degrees. An hour after the end of the ride, as I write this, the sun is finally out and temperatures are on the way up, but that didn't do us much good this morning as our group of 30 intrepid cyclists set out for Stevens Canyon and the season's first ascent of Mount Eden. If you're not doing so already, you might also want to consider using flat-resistant tires. Fog, light drizzle, and wet roads are a common occurrence on the ride in June. The technology has improved considerably over the years, and there's now very little weight or stiffness penalty incurred by using them. And the time you save in changing flats can be very important on an event such as ALC where, although it's not timed, you have a time limit for each day of riding. I've used Specialized Armadillos in the past and now use Continental Gatorskins, and in five ALCs, I've never had a flat while on the ride. (Knock on wood.) That's more than 2,800 miles. Physically, we crossed a significant threshold in today's ride. By riding for more than two hours, we went past the point at which most riders can exist only on stored energy while riding. It's very important that you properly and regularly eat and drink on rides, or else your ability to complete the ride will be compromised. Moreover, poor nutrition can affect not only your physical health but also your mood. Case in point: Today, I ate well during the first half of the ride, but then I went back to having just water during the second part of the ride. Between the left-turn signals that wouldn't trip for us, a couple of less-than-friendly drivers, and the ongoing chilly fog, my mood started to turn foul even though I was going generally downhill and that part of the ride wasn't all that challenging for me. Not until I got back to Mountain View, when I had some proper food, did I return to being my usual cheerful self. In June, a positive mood is as important as proper physical conditioning. When you get in a bad mood while riding, you're more likely to do stupid things. This can affect not only you but other riders around you -- by either taking them into your bad mood, or (even worse) by doing something that puts other riders in danger. While riding, pay attention to your frame of mind. If it turns sour, check to see whether you're eating properly for you. And if you should go into a really bad mood -- yelling at another rider, for instance -- stop where you are, take yourself off the route, and eat, drink, rest, and/or meditate until your mental state is again safe for riding. In June, support crews are trained to spot riders whose heads have gone into bad places, and they can remove you from the ride if you become a danger to yourself or other riders. Don't let that happen. What's next? 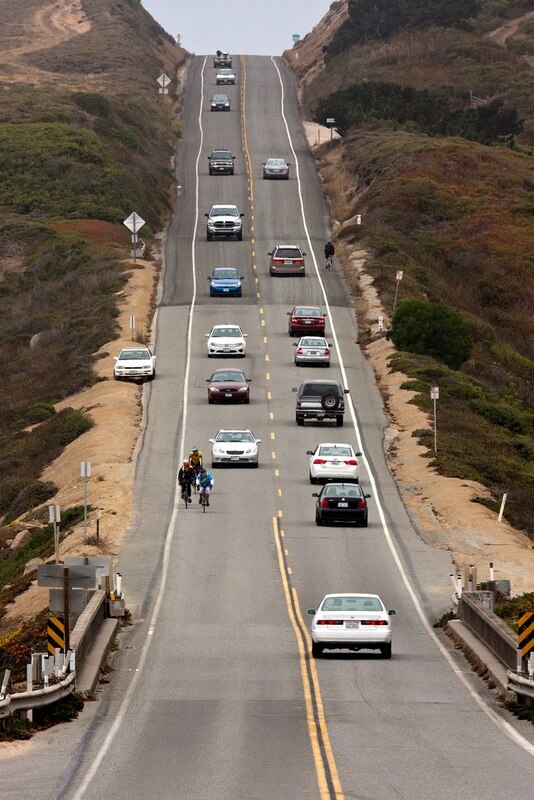 Weather permitting, I'm running a 41-mile ride across the Dumbarton Bridge next Sunday. But the forecast currently isn't looking all that great, with a somewhat big storm in the cards for next weekend. If we get lucky and have a heavy-rain-free window on Sunday, we'll ride of course. But I'll be checking our route carefully because there are two places that often go underwater in heavy rains: the bicycle approach to the Dumbarton Bridge, and the semi-abandoned bike path along the north side of Highway 237. If either or both of these routes are inaccessible, I'll need to modify our route, and it's possible that we might not be able to cross the bridge after all. But if the route does change, it'll be to one of approximately the same distance and flatness. You can read more about the route and sign up here. That's my last scheduled training ride of 2010. Looking ahead into January, two sets of rides start up. Beginning Saturday, January 15, the Distance Training rides are for intermediate and advanced cyclists. We'll start at 40 miles and build to 125 miles by mid-May. Beginning with the third ride in this set, the average pace will increase to 12-15 mph, so they're probably not the best rides for beginners. Find out more about these rides here. And every Sunday beginning January 30, Cat-2 (10-12 mph) rides of similar distance and difficulty will be offered in at least three locations around the Bay Area: San Francisco, Orinda, and Sunnyvale. These rides begin at around 20 miles and build to around 100 miles by May. Even if you ride faster or longer, these rides are an excellent supplement to your program. Details about these rides will start appearing soon in the official ALC calendar. Thank you for being part of AIDS/LifeCycle. And get this: My total cost was only $19.99, including shipping. 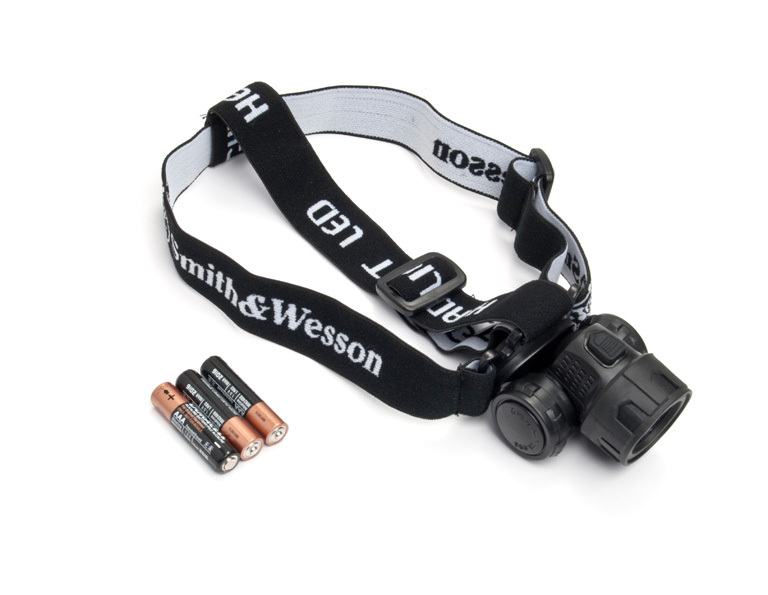 Here's the puppy, the "Smith & Wesson 3-Watt Cree LED Head Lamp." Yes, it's a headlamp. But that adjustable head strap wraps nicely and securely around a handlebar to provide a snug fit on a bicycle as well. And as the picture shows, it's miles above bicycle-specific LED headlights that don't require special batteries. (This was a requirement for me because nighttime randonneuring called for long run times without recharging. Spare AA or AAA batteries are easy to carry, and they're almost always available at nearly any convenience store.) It's also considerably smaller and lighter, another bonus. I haven't tried a full-nighttime ride yet, but I did have it out after sunset tonight, and it clearly was superior to the lights I'd tried previously ... and at about one-third the cost. Today we learned that a 70% chance of rain does not always mean a washout. Our intrepid group of 15 riders (plus awesome support from Dennis) braved only a couple of scattered raindrops on our 22-mile ride from Mountain View to Cupertino and back, the first official Mountain View training ride of the ALC10 season. The skies sure looked ominous at times, but we got lucky and dodged the rain. Although the ride was officially a Cat-2 (10-12 mph pace), the threat of rain served as a fantastic motivator, bumping everyone's speed up a couple of notches and getting everyone back to Mountain View in less than two hours. Good thing, too -- just 20 minutes after the end of the ride, a heavy shower drenched downtown! Everyone on today's ride was a veteran ALCer, so you already know the drill about the new season, getting (back) up to speed, proper nutrition, and stretching. If you've been off the bike for a few months, don't overextend yourself early in the season. And get back in the habit of eating properly before, during, and after your rides. Our next scheduled ride is next Sunday, when we'll take a 32-mile trip up and over Mount Eden into Saratoga. Details and RSVP are here. The Distance Training rides begin Saturday, January 15, with a 40-mile ride to and around Woodside. Go here to learn more about what's planned for this season's Distance Training rides. Welcome to our new season, and thank you for being part of AIDS/LifeCycle. The Distance Training rides are for intermediate and advanced riders who want to increase their physical and mental endurance on long-distance rides. This set of 10 rides gradually increases to a mid-May finale of a double metric century: 200 kilometers (125 miles) in a single day. These rides should be just one part of your overall AIDS/LifeCycle training program -- such as in conjunction with the weekly Cat-2 rides -- and are not sufficient by themselves to prepare for the event. We start this year's rides with an easy confidence-builder that heads up Foothill Expressway past Stanford to Portola Valley. We'll head into Woodside and then play around in the rolling hills there for a bit before heading back. Total climbing for this ride is about 1,700 feet. Riders from all over Northern California are invited! Southbound Caltrain from San Francisco arrives at 9:29 a.m.
Read about what's planned for the rest of this season's Distance Training rides. With the opening of the new Mike O'Callaghan-Pat Tillman Memorial Bridge over the Colorado River at Hoover Dam, the prospect of bicycling from metro Las Vegas to Arizona has become a whole lot easier. So I set out on a ride from Henderson through the Lake Mead National Recreation Area to the new bridge, which at about 900 feet above the river is the second-highest bridge in the country ... and the "highest and longest arched concrete bridge in the Western Hemisphere," according to this report from The Arizona Republic. One of the recreation gems of Las Vegas is the River Mountains Trail, a 35-mile loop on the Nevada side of the Colorado River. All but 3 miles of it are now complete, and this provides a way for cyclists to get from Boulder City to Henderson without having to ride on the extremely busy 93/95/515 freeway -- something that was a white-knuckle experience for me last time I rode to Boulder City a few years ago. 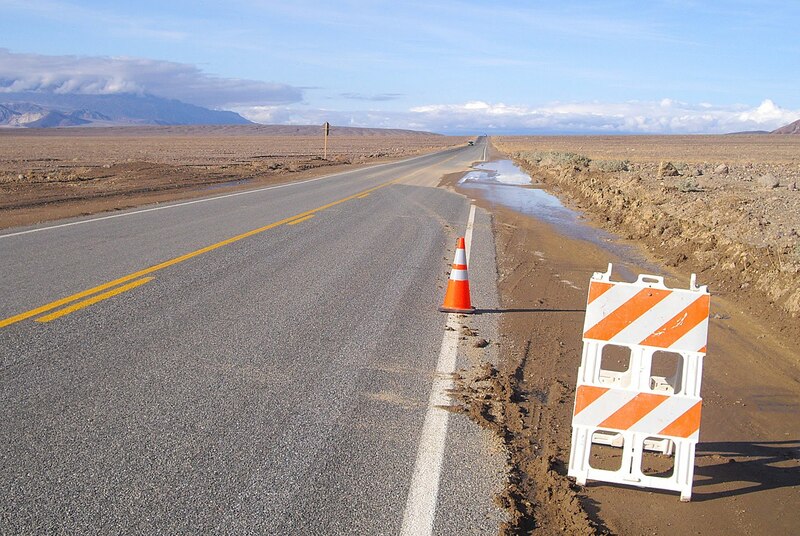 But I instead began the day on highways, as a freshly-resurfaced Lake Mead Blvd. took me the 8 easy miles to the Lake Mead NRA entrance. The entrance fee is $3, but my receipt from a roadtrip the previous day was still valid. At midmorning, the road was almost empty, and the recent chilly winds had left striking vistas in every direction. The road itself was generally downhill toward the river but with short, moderately steep climbs every couple of miles to get up and over ridges. A smooth, paved shoulder of adequate width wasn't an official bike lane, but it served the role nicely. About 6 miles into the recreation area, I noticed that a paved trail had appeared next to the road. Then I realized what I had done: The River Mountains Trail was actually a completely separate route through the recreation area, not the road itself! (And if you enter via the trail, there's no entrance fee.) In fact, that part of the trail had been so far from the road that I hadn't even noticed it. So I switched from the road to the trail at that point. Car traffic was beginning to pick up by this point, so that decision was probably a good one to make. But the first thing I noticed was that the trail wasn't engineered for cars: The grades were steeper, the curves were tighter. And storms earlier in the month had left sand, rocks, and dirt strewn over parts of the trail, especially in the washes. The route also wasn't nearly as direct as the road, dropping down to bypass a quarry and then climbing back up to highway level to cross some more washes. The exit from the recreation area was about 22 miles into the ride. I had seen trail maps that suggested an old railroad trail had been converted into bicycle use to provide easy access to the Hoover Dam area. But when I got to something that appeared to be the junction with that trail, all I saw was a graveled path labeled "Railroad Trail." Unless I missed something, the trail is suitable only for mountain bikes. This meant that I had to get back onto U.S. 93 for the final few miles to the dam. (Making the left turn onto 93 required a wait of several minutes.) The highway is just two lanes wide here, and traffic was slow enough that I wasn't terribly nervous riding on the narrow shoulder, but it's definitely not something for beginners. After a couple of miles, the new bypass began, and the highway changed into a freeway. The shoulder became wide and smooth, and it was a gentle downhill all the way to the highlight of the day: the new bridge. Well ... a highlight in the sense that I can now say I've bicycled across the Hoover Dam bridge. Not so much of a highlight because, by design, you really can't see anything from the traffic lanes of the bridge. (Otherwise, drivers would be slowing down and stopping! Indeed, multiple signs warn drivers that stopping on the bridge is prohibited.) I did sneak one picture just before the beginning of the bridge, but to get any real views of the dam itself, you have to go to the parking area (and past the Homeland Security inspection checkpoint, which remains in operation and where they can search your vehicle if they so choose) and walk to the bridge pathway. I did this the next morning, and even at 9 a.m., the tourists were packed more tightly than the Golden Gate Bridge on the best day of the year. After bicycling across the bridge, however, what happens next? Because it's a freeway and there's a giant concrete divider down the middle, you can't just turn around and head back. Fortunately, the first exit in Arizona is only about a mile away, so I took the offramp and crossed under the freeway to head back in the opposite direction. Both ramps, however, had huge, scary cattle guards that I didn't feel safe riding -- or even walking -- across, so I very gingerly traipsed along the edge of each, one foot in front of the other. Back in Nevada, the route is the same back to the recreation area. I could have rejoined the River Mountains Trail there, but the only access point was back down a steep hill, which would mean that I would have to climb it again. And the hill in front of me was plenty steep as it was: the climb into Boulder City, which gains almost 1,000 feet in just a couple of miles. This was still on busy U.S. 93, with two uphill lanes and a narrow but serviceable shoulder as lumbering, struggling semitrailers passed just a few feet to my left. Finally, there was a trail access point about two-thirds of the way up the hill, so I switched over to the trail, which at this point was actually in a concrete flood control channel. After reaching the "top" in Boulder City, the trail continued to climb a couple hundred feet more, reaching a high point of 2,694 feet -- much higher than the highway route through the area. But this is where the ride became lots of fun. From that top altitude, it was almost a steady, gradual downhill all the way back into Henderson. And with my memories of the 93/95/515 freeway from my earlier trip, I was quite happy to be off the highway and on a smooth, scenic trail that deposited me onto quiet residential streets in Henderson. For the day, I racked up about 53 miles and 3,800 feet of climbing -- a hefty challenge, eased somewhat by the cool temperatures and relatively light winds. Now that I know the difference between the road and the trail, I might be more inclined to use more of the trail next time I do this ride. WEATHER ALERT: If we ride Sunday, we will NOT use the original Dumbarton Bridge route that had been scheduled. Instead, we will use the route shown in the map at right, which returns to Mountain View at both mile 12 and mile 22 so that we can end the ride easily if the weather turns bad. For this rainy-day alternate route, we're doing three short and easy rides that each return to downtown Mountain View. Our first loop takes us along the bayshore past the Googleplex and up to the Palo Alto airport before returning. Our second loop takes us into Sunnyvale and to our one rest stop of the day at the Starbucks at Fremont and Mary, perhaps better known as the starting point for the Sunday Cat-2 rides. Our third and final loop takes us up the Bryant Street bike boulevard into downtown Palo Alto and then back on some side streets that we don't normally use. Only about 570 feet of climbing the whole day, with no hills worse than an overpass. Riders from all over Northern California are invited! Southbound Caltrain from San Francisco arrives at 9:29 a.m. Note that if you arrive via train or light rail, you'll need to walk three blocks northwest from the station, across Castro Street, to the corner of Evelyn and Franklin. The meeting place is not at the station itself. Be sure to check the Training section of the ALC website for information on how to prepare for a training ride and what you must and should bring. 10:19 p.m. Monday: I send email to a contact at the town's Public Works Department that I found on the town's website. 11:13 p.m. Monday: I get a response (yes, practically in the middle of the night!) that the problem will be investigated. An actual response, not an auto-reply. 10:21 p.m. Tuesday: I get a note saying that the pathway was cleaned today, and thanking me for my report. The moral: When you encounter a hazard while riding, always report it to the appropriate authority. You might prevent some other cyclist or road user from a flat, an injury, or something worse. If you want to do it the old-fashioned way via a voice call, the Silicon Valley Bicycle Coalition has a list of phone numbers for most jurisdictions. Photo: Laura Court at the quarry, from Google Street View. It's actually far more scenic than it looks here, and if you've never been up there, it's worth the climb. After leaving downtown Mountain View, we'll head through Cupertino and then ride through the rolling hills of scenic Stevens Canyon. Next comes our significant climb of the day: the 0.7-mile ascent of Mount Eden out of Stevens Canyon. It's steep but not ridiculously steep, and you can always walk part or all of it. (Come back later this season to see how much you've improved!) We'll take a break in Saratoga Village and then go part of the way toward Los Gatos before heading back on an easy, mostly downhill route. Total climbing for the day is about 1,550 feet. Whether you're a first-time ALCer or a veteran rider, join us as we kick off another season of training in Mountain View with the first of three "early-bird" rides on consecutive Sundays. Meet new faces and reconnect with friends from past adventures on this mostly easy ride that goes ever so gently into the beginning of the foothills. We'll help you on the road, and we can help answer your questions about the ride, your bicycle, and the upcoming training season. From downtown Mountain View, we'll head into Sunnyvale to begin our very gradual climb to De Anza College in Cupertino. 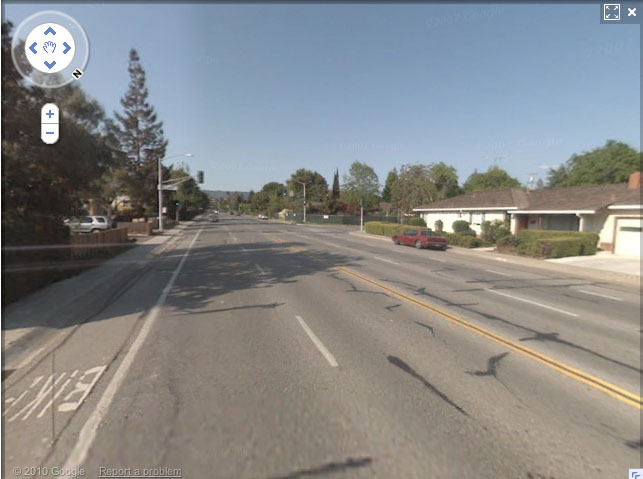 Then we'll tackle our one hill of the day, westbound McClellan as it crosses Stevens Creek. It's very short but a little attention-getting, and it's perfectly OK to walk it. (In ALC, we call that "cross-training.") 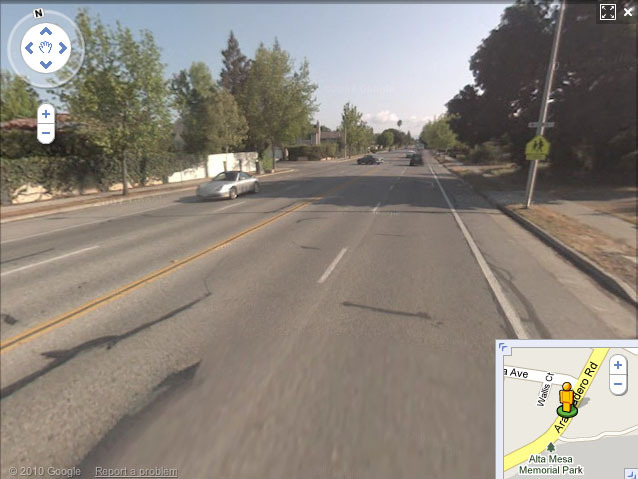 Then we'll ride on Foothill Expressway, a very popular bicycling route, to our rest stop in Los Altos Hills. 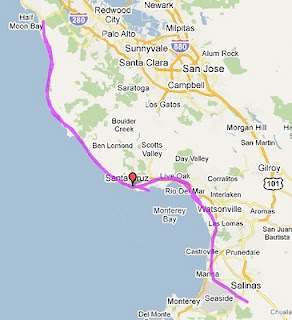 After that, we'll continue into Palo Alto and then head back down for a flat return into Mountain View. Total climbing for the day is only about 550 feet. Riders from all over Northern California are invited! Southbound Caltrain from San Francisco arrives at 9:29 a.m. Note that if you arrive via train or light rail, you'll need to walk three blocks northwest from the station, across Castro Street, to the corner of Evelyn and Franklin. IMPORTANT: The meeting place is not at the Caltrain station itself. Check the map link if you're not familiar with the area. The fourth season of Distance Training rides begins Saturday, January 15 in Mountain View. These are challenging rides for intermediate and advanced cyclists, with a focus on increasing distance to and beyond the longest days of AIDS/LifeCycle. For many riders, ALC is as much a mental challenge as it is a physical challenge, and the Distance Training rides are a great opportunity for you to get experience spending long hours in the saddle ... and dealing with all of the issues that come up for you on such long rides. Here's a quick preview of what I'm planning for this season. As always, the routes and descriptions are subject to change, but this will give you a good idea of what to expect. Distances are approximate. All rides leave from the Caltrain overflow parking lot in downtown Mountain View. Ride 1: 40 miles, January 15. We'll visit Woodside on routes that will be familiar to anyone who's done the Palo Alto rides this autumn. Nothing overly challenging, but this is a good introduction and gives you the chance to meet other riders. Ride 2: 45 miles, January 29. To Los Gatos and a little bit beyond, with a significant climb up Kennedy Road and briefly into San Jose before returning on an easier route. Ride 3: 50 miles, February 5. (Note that there's no week off before this ride! This is to keep our calendar in sync with the major ALC events of the upcoming spring.) This is one of the more devious rides -- 25 miles of nearly flat terrain followed by 25 miles of quite hilly roads. Your challenge is to resist the urge to ride all-out in the first half of the ride so that you'll have sufficient energy for the second half. Many riders are surprised at how easy it is to run afoul of this ... and this is a very necessary skill to get you through the ride in June. Ride 4: 60 miles, February 19. We'll head up the Peninsula into the Crystal Springs area, but not quite to the dam because of the ongoing closure. 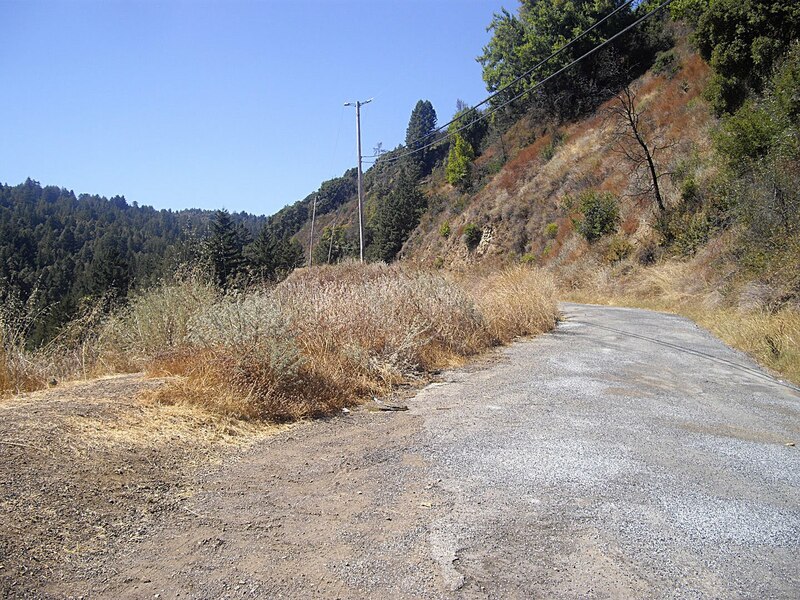 We'll climb the Polhemus hill and then enjoy the thrilling descent down Ralston before taking Alameda de las Pulgas all the way back to Menlo Park. Ride 5: 70 miles, March 5. We'll go out into seemingly the middle of nowhere around Calaveras Reservoir, high in the hills above Milpitas. We'll climb Calaveras in the shorter, steeper direction and then cruise through the hills before returning through Sunol and Niles Canyon and across the Dumbarton Bridge. Ride 6: 80 miles, March 19. Get ready to climb! We're going to Half Moon Bay via Highway 92, just like the traditional Day 1 route of ALC, and we'll continue down the coast to San Gregorio before turning inland and climbing Highway 84 to Skyline Blvd. Total climbing for the day is about 4,400 feet. Ride 7: 90 miles, April 2: Get ready to climb again! After taking an easy route into Hayward, we'll climb into the CSU East Bay campus on the notorious route from the Seismic Challenge ride in October, all the way to the top of the Hayward Hills, followed by a steep descent into Dublin Canyon. We'll climb over the Dublin Grade and drop down into San Ramon for a somewhat less stressful ride into Sunol and back through Niles Canyon. One long, steep climb, but only about 3,000 feet total for the day. 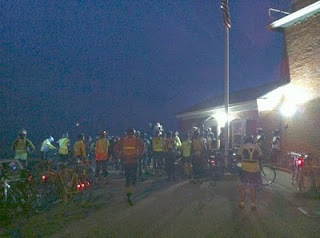 Ride 8: 100 miles, April 16. For our first century ride of the season (and quite possibly your first century ever? ), we'll make a giant loop around the South Bay. We'll visit Los Altos Hills, Palo Alto, Menlo Park, Newark, Fremont, Milpitas, San Jose, Los Gatos, Saratoga, Cupertino, and Sunnyvale. One significant climb: Silver Creek Valley Road in south San Jose, and our reward will be quite possibly one of the most exciting urban descents in the Bay Area. Ride 10: 125 miles, May 14. This is it ... the Fourth Annual Altamont Pass Double Metric. Now part of ALC legend (the longest one-day training ride on the nationwide ALC calendar), this ride has a little bit of everything: scenic backcountry, suburban sprawl, and busy city streets. About the only thing it doesn't have is any extremely steep climbs; total climbing for the day is only about 2,600 feet, so the ride is more a test of your endurance than of your climbing strength. Weather can be the biggest challenge on this ride; in the past, temperatures have exceeded 100 degrees along parts of the route. But in 2010, riders were lucky to have an unusually cool day in the 60s, so anything can happen. We have outstanding volunteer support on this ride, including well-stocked SAG vehicles and a group of dedicated roadies who are committed to helping you conquer this challenge. Rides 1 and 2 run at an official pace of 10-12 mph. Beginning with Ride 3, the pace increases to 12-15 mph. Faster riders are always welcome, but be sure you know how to read a route sheet so you can navigate on your own. You can't sign up for these rides quite yet, but save the dates. When RSVPs are open, the rides will be posted both here and in the official ALC training ride calendar. I look forward to riding with you on the 2011 Distance Training rides. Photo: Riders descend Altamont Pass almost halfway into the 2010 Altamont Pass Double Metric. I'm still here; I merely sent this blog on vacation for the past month or so while I get mentally ready for the upcoming season of AIDS/LifeCycle 10 training rides. I've still been riding; in fact, I recently passed 6,000 miles for the year so far and am likely headed toward my second-highest annual mileage ever. In the meantime, however, I've just signed up to ride the Death Valley Century on February 26. This will be my second time on this ride, but the first was way, way, WAY back in 2004 ... long before I was part of the ALC family, and about 35,000 miles ago in my training. While most of this route of the Death Valley Century is relatively easy (there's another route in the fall that is significantly more challenging), I found the ride quite difficult six years ago, and I'm curious to see if my perception of the route will change -- especially the strenuous climb to Jubilee Pass (pictured, 2004), since the climb actually starts well below sea level. If you're an intermediate or advanced cyclist who's part of ALC for the first year or the 10th, I invite you to join us in Mountain View every other Saturday starting in early January. We'll start with a 40-mile ride and gradually work our way up to the double metric with rides that are exquisitely planned and mapped and usually with outstanding support by our volunteer crew of SAG drivers and friends. You'll get an excellent preview of what days on the ride in June will be like, and you'll get to see parts of the Bay Area that you might have never seen before. Before that, I'll probably run a couple of warm-up rides in December; details on those are coming soon as well. Today's 50-mile ride took me someplace I'd never been on a bicycle: to the summit of Sierra Road just outside San Jose, about 2,030 feet high above Silicon Valley. I took the "easier" route to the top up the backside, unlike the Tour of California cyclists who climb the massively brutal Sierra Road directly to the top on a steady 3-mile grade of more than 10%. But "easier" is all relative here; I still had to gain all that elevation in just a few miles, and once up there, a series of rolling hills kept me on my toes. But there was an important difference today. I was by myself. This isn't about being antisocial. But many of us are inherently competitive, and this spirit can easily manifest itself even on a recreational or group ride. With nobody in front of or behind me, I could climb at my own pace, stop when I wanted, and not worry about what anyone else would see or think. In fact, early in the ride before the climbing began in earnest, another cyclist passed me on Tasman Drive, and I instinctively sped up to keep pace with him until it was clear that he was far faster. Whenever possible, try to make every ride your own. Photo: Sierra Road winding through the hills, about 2,000 feet above San Jose (in the haze at the bottom). Regular readers of this blog might recall that hills -- especially steep ones -- often put me in a mood most foul and leave me hating the world, the ride, and myself, often all at the same time. Since I started tracking my calorie expenditures about a month ago, I've come to the conclusion that I've been taking in far too few calories for the distance and pace that I usually ride. So I started experimenting with some high-calorie powdered mixes, and I used one today, apparently to great advantage, since even the toughest climb I'd done in a long time didn't ruin my day. If my heart rate monitor is to be believed, I burned 7,781 calories on today's ride, counting the off-the-bike time I spent at rest stops. In return, I took in about 2,150 calories, about 1,250 of which were in liquid form -- a bottle of Odwalla strawberry-banana juice, plus three water bottles mixed with Perpetuem. The most substantial actual food I ate during the whole ride was a solitary blueberry bagel, although I had a good breakfast before riding and a big sandwich (with, shhhh, curly fries ... don't tell anyone) immediately afterward. And I think it served me well. The instructions for Perpetuem warn that mixtures can go bad after a few hours, so there's a strong motivation to consume the liquid regularly, which I did -- at the rate of about one bottle (300 calories, in the proportions that I used) for every two hours on the bike. At the end of my 80 miles, I was riding strong, and I don't think it was entirely due to the moderate tailwind that was pushing me into Pleasanton. Perhaps I could get the same effect by eating more actual food while riding, but attempts to do so in the past have often left me with an upset stomach and reaching for the Pepto-Bismol. I took in about 350 calories per hour of riding, which might be just a wee bit low for my weight but probably a lot closer than I've come in the past. This merits continued investigation, since anything that keeps me happy on difficult rides is probably good for my cycling psyche! And a final postscript: Giant, big thanks to everyone in the Seismic Challenge family who welcomed me into their "home" today. As a non-fundraising faux rider, just the route sheet creator, I didn't want to interlope into the big day for everyone else -- the riders who by all measures did an awesome job of fundraising, the roadies who made this difficult route a success for everyone, and the foundation staff who brought it all together. You're the real heroes of the day and the weekend. Photo: Climbing Hayward Ave. (center foreground), looking west toward the San Mateo Bridge. My two-year-old $49 cycle computer finally bit the dust for good this week -- not just a dead battery (at either end); the transmitter just stopped transmitting to the receiver. When I went to buy a replacement, the selection at my local shop had gone down considerably; I guess the cool kids mostly buy GPS-equipped powerhouses that have more computing power than ran my entire college way back when. I, on the other hand, stuck with the lower-tech solution, and I bought the most expensive cycle computer on offer: the Cateye CC-MC100W Micro Wireless, store price $50. It does everything you'd expect a cycle computer to do, and the tiny night light would be a nice addition if I ever do more long randonneuring events. But there is, for me, a huge design flaw that left me shouting choice obscenities at the sky during today's ride. On the CC-MC100W, two buttons are easily accessible to the user while riding. The top button cycles among the various display modes in the small digits (distance, odometer, pace, time, max speed, and so on). The lower button, on the front of the device, turns the computer on or off if auto-on isn't set. So today, while I'm riding, I want to check my pace for the day so far. With my gloved right hand, I grab the cycle computer and start to press the top button to cycle through the displays. And everything suddenly goes back to zero! I lost my stats on my first 29 miles of riding today. Why? Pressing both buttons simultaneously -- even for an instant -- is the "reset" command. Did anyone bother to think that a cyclist might naturally grab the front of the computer? Perhaps it's not such a big deal when wearing fingerless cycling gloves, but that really shouldn't be a requirement. And why does the reset happen almost immediately? On my last computer (manufactured by Sigma), the reset sequence took at least five seconds of constant pressure on two buttons, both at the top of the unit and almost impossible to do, accidentally or otherwise, while riding. Rarely do I see a design flaw this bad in higher-end cycling products. If I hadn't already attached the unit to my bicycle and clipped the twist ties, I'd return it -- but I also don't want to spend another $50 on yet another computer. Sorry, Cateye, I think you blew it on this one. Update: Today, on my second ride with the new computer, it registered a maximum speed of 56.3 mph, thanks to interference from some unknown source. With my previous Sigma, in more than 13,000 miles of cycling, never once did interference cause erroneous data. (The worst that ever happened is that the receiver would stop processing for a few seconds, especially near the ferry terminal in Tiburon, but it would catch back up quickly when the link to the transmitter was re-established.) Another black mark for the Cateye. Again this year, I was honored to be asked by the Seismic Challenge staff to create the route sheets for this year's ride, a 206-mile, two-day route from San Francisco to Livermore to Yountville on Oct. 2-3. The Seismic Challenge route changes somewhat every year. This time around, part of the route was on streets and highways that I'd never seen, let alone cycled. So although I got a detailed turn-by-turn list from the ride organizers, I realized that I couldn't do a truly effective job of creating a useful route sheet unless I saw the route myself. With that in mind, I packed up the car and headed up to American Canyon for a 40-mile ride to and through Napa and back. -- Street signs often are missing, or they don't agree with Google Maps. In Napa, I was particularly surprised at how many street signs were missing within the city limits, as opposed to out in rural nowheresville. Because the Seismic route is marked with route arrows, unsigned streets aren't overly problematic, but if you're making a route sheet for an unmarked route, you need to provide enough visual cues to direct riders through unsigned turns (for example: "first stop sign"). -- Turns that appear to be hard rights or lefts on maps can sometimes be gentle bends, or the other way around. When a cyclist approaches a Y-style intersection, a route sheet says to go "right" is more confusing than one that says to "bear right." -- Cue sheets automatically generated by some mapping tools, most notably Map My Ride, are notorious for inserting phantom turns that allegedly travel a very short distance before continuing in the desired direction. Other mapping anomalies that can pop up include weird loop-de-loop routings that try to deposit you on the wrong side of a divided highway. -- Driving a route sometimes yields less satisfactory results than actually riding it. At one entrance to a bike path, there was no curb cut to allow cyclists to ride directly onto the path, forcing a dismount after an especially tricky left turn from a high-speed divided highway. This is the type of thing that cyclists should know about in advance. -- Another thing that test drivers might not notice as much as test riders is the road condition, especially potholes, bumps, ruts and other obstructions that might affect the side of the road more than the main vehicle lanes. Particularly on descents and other technical parts of a route, it's helpful to warn riders of substandard road conditions. Many other route sheet designers, particularly in the randonneuring world, include incremental distances on each step of the route sheet. (For example, "At mile 29.0, turn right on Main; continue for 1.5 miles," phrased in a tabular format, of course.) Seismic and ALC don't do this, and that's why you don't see that style here. Incremental distances can be helpful for cyclists whose cycle computers or GPS units don't synchronize exactly with the printed distances, or who detour from the official route and later rejoin it. One small problem about test-riding a one-way route such as Seismic: Unless you coordinate multiple vehicles and multiple riders, there's often no easy way to get back to your starting point. I solved this by only riding 24 miles of the route in Napa; I was able to chop my return down to only 16 miles by taking a more direct (and stressful) route that certainly wouldn't be appropriate for a large group ride. So, unfortunately, I didn't get to see the very end of the route in Yountville, but a combination of the helpful, detailed instructions from the organizers and careful reading of Google Maps and Street View, and I hope that I've covered all of the main points. The test will come in early October when this year's intrepid group of Seismic riders sets out on their journey to raise much-needed funds for the San Francisco AIDS Foundation. Here's to all of them; one of these years (2011? ), I might join you officially. Two years ago, I bought a heart-rate monitor on closeout from Woot. (And from that link, I see that they later offered it for even $5 less than I paid for it. Sigh.) Because I found it too awkward and complicated to use while in motion, it went into the random-crap drawer shortly thereafter. But I brought it out of cold storage today because I tackled a new challenge for me: climbing Eureka Canyon Road (pictured) from Corralitos in coastal Santa Cruz County. This 41-mile route had about 4,100 feet of climbing ... or about an even 100 on my difficulty scale, about as challenging a ride per mile as I ever attempt. I've recently been curious about how many calories I really burn while riding. I've typically used the ballpark figure of 60 calories per mile (humans of lesser bulk than I will consume far fewer), but I figured this ride would test that limit. And based on the numbers, it certainly did. Given my age, gender, and weight, this HRM claimed that I burned a whopping 3,687 calories on this ride, or just about 90 calories per mile. And that's an average, which includes the corresponding 4,100 feet of descending as well. Of the total calories, only about 600 were burned on the descent from the summit back into Soquel, mostly due to a couple of annoying little hills on the way back down. How does that compare to online calorie calculators? I get anywhere from about 2,800 to 3,300 calories from the various websites. These, however, base their calculations only on speed and not difficulty of terrain. So even though my reported number seems a little high, I'm somewhat confident that it's a reasonable number given the nasty climbing. But this raises all sorts of nutrition issues. Replacing 3,687 calories while riding, or even soon thereafter, just isn't practical or healthy. Before the ride, I had a bagel; while riding, I had another bagel, a bottle of electrolyte drink, a bottle of Odwalla, and a bag of Sport Beans -- for a total of about 1,000 to 1,100 calories. Now for those of us trying to lose weight (and that includes me), this sounds like a good thing indeed -- a 2,500-calorie deficit is about seven-tenths of a pound right there, just on one ride! (Recall that 3,500 calories equals one pound.) But my experience has been otherwise. It's hardly a secret that, during the five years I've done AIDS/LifeCycle, I've not lost any weight. In fact, I've gained 30 pounds. (That would be 40 pounds, except that I've managed to lose 10 this year somehow.) And while it would be nice to pretend that all the weight is in leg muscles, that wouldn't fool anybody. For all of the good things that have happened to me through ALC, this is my biggest disappointment, especially since I wasn't exactly svelte in 2005 to begin with. And while my off-the-bike food habits aren't the best in the world, it's not like I'm eating too much. In fact, I've suspected for quite some time that I often eat too little, sending my body into a starvation response that hangs on to every last globule of fat as if it were golden. According to The Cyclist's Food Guide (2005), I currently need 2,860 calories a day just to break even on a no-cycling day. That's a lot of Subway foot-longs. Add another 3,687 calories from a ride of just 3.5 hours, and we're getting into a third trip through the buffet line. And something like my recently-completed 300-kilometer ride might have consumed as many as 12,000 additional calories (and, for me, perhaps even more) in just one day! That is more than 35 Lean Cuisine barbecue chicken microwave pizzas! But then the math gets slightly more complicated. The daily baseline -- 2,860 calories for me -- allegedly doesn't include cycling. But in the 300k, I was riding for more than 17 hours, or the better part of a day. Do the cycling calories add to the baseline, even though I basically did nothing but cycle for the whole day? Or do I need to reduce the baseline to reflect just the seven hours that I wasn't on the bike? I've tried to find places online where nutritionists talk about things like this, but I've come up empty. It's a big deal, too -- because an extra 2,000 calories or so per cycling day can certainly add up to extra pounds in no time at all. Randonneurs and other very-long-distance cyclists need to develop a nutrition strategy that works for them, and everyone seems to have their own. I found this long discussion at the New Jersey Randonneurs website in which several riders share their secrets. On AIDS/LifeCycle, we're fortunate that our meals are prepared specifically to meet our extreme caloric and nutritional needs, but even there, it's important to find something that works and then stick with it -- experimenting while on the ride in June merely invites stomach distress. I keep experimenting. Some things that I've found to work well for me: Odwalla strawberry-banana smoothies (or the fresh-made version from Starbucks), bagels, a Subway meatball sandwich, and the occasional deli-style turkey sandwich. Spicy foods don't do it for me -- no burritos or kung pao chicken while riding. I've never experimented with the "athlete's" high-calorie liquid meals (such as Spiz); perhaps it's just another part of refusing to declare myself a "serious" cyclist. Post-ride pizza and pasta seem to work well (much love for Mi Amore in Lompoc), but never in the middle of a riding day. All that said, however, I'm obviously still not there, or else I wouldn't still be packing these 30 extra pounds that make me sad. I suspect a sports nutritionist could have a field day with me, but the cost for those I've seen is beyond my budget (particularly in this uncertain economy) ... and I'd probably be an ornery and difficult customer anyway! I've attended the ALC nutrition workshops, and I have all the books here as well (and I've actually read them), so I have the basic tools and knowledge. It just hasn't worked for me. In a future post: How these nutritional considerations tie into one's mood while riding. If you've seen me get grumpy on the streets of Santa Cruz (as I was yet again at the end of today's ride), you'll know what I'm talking about.